The Andrion Club, the Port Authority of Andros, the Association of Volunteer Firefighters of Andros – SEDA, the Andros Yacht Club and the team of the LIFE Andros Park project organize and invite you to the cleaning of Paraporti Beach in Chora. The beach cleaning will take place on Sunday 24 March at 11.00. Meeting point will be the “The Rock” canteen. 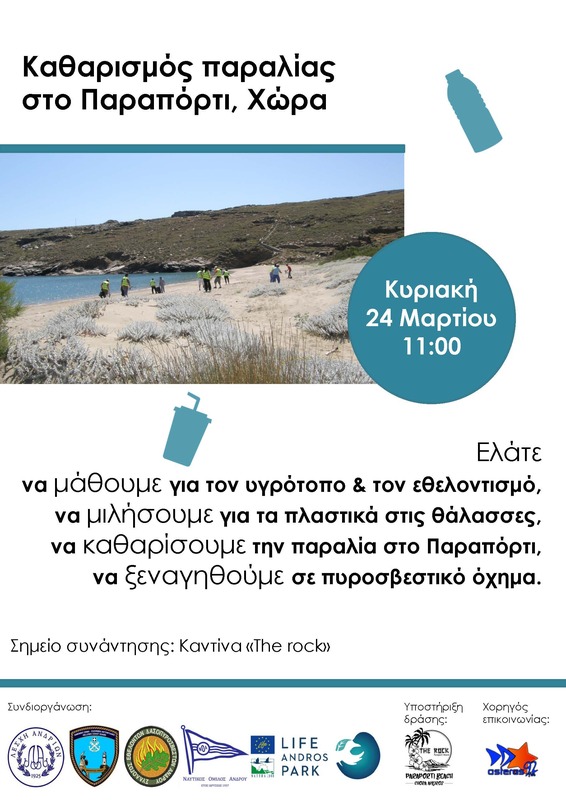 The participants will be informed about the value of the wetland in Paraporti, by the LIFE project team, followed by the beach cleaning and the parallel information on marine litter and the ways we can help to tackle this problem, by the Andros Port Authority and the LIFE project team. After the cleaning, SEDA will present to the participants its fire brigade and inform them on volunteering. It will be an opportunity for teambuilding, collaboration and taking action to care for our environment. Families, young people, adults and children can participate. The action is supported by “The Rock”, operating on this beach. Communication Sponsor: Asteras radio 92.